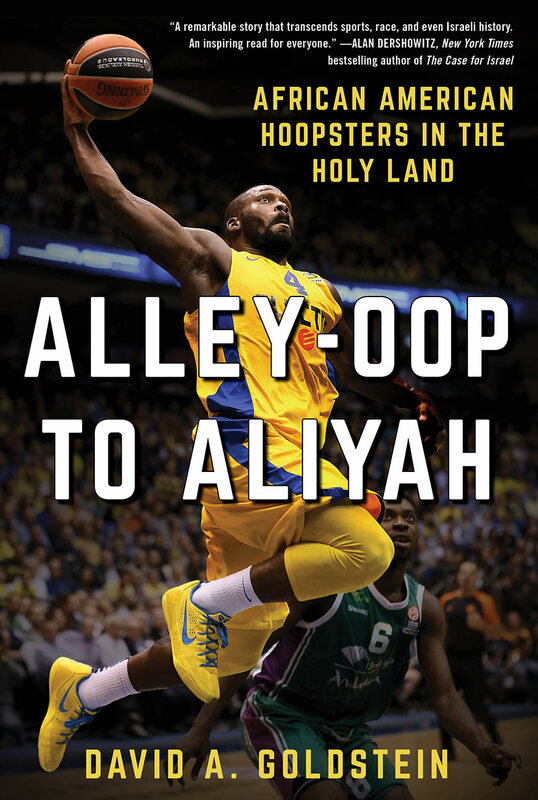 The concept for Alley-Oop to Aliyah: African American Hoopsters in the Holy Land originated in the most unlikely of places – an assisted living complex for seniors in a religious neighborhood of Jerusalem. I was there with my older brother in May 2007 visiting my grandparents, who had invited some of their friends over to drink coffee, eat dessert, and swap stories about their respective grandkids. The guests (all well into their 80s, and all but my late grandfather, female) displayed tepid interest in my brother’s medical practice and my legal and journalistic efforts, but the tone of the gathering took a distinct and fortuitous upturn when my grandmother mentioned where my brother and I were from – Toronto. I was blown away by the reaction. I had known that Maccabi Tel Aviv, Parker’s former team, was a European powerhouse, and I was aware that Israel had its own domestic professional league. I also knew that, similar to other international basketball leagues, some of the players in Israel were African American expats. But I had no sense of the hold the game had on the State of Israel, or the admiration and fondness its citizens felt for its African American players. Those elderly women loved Anthony Parker like he was their own grandson, and by the time they left my grandparents’ apartment, my curiosity – about basketball in Israel, generally, and the experience and impact of African American players there, specifically — was piqued. I boarded my flight home with printouts of as many Israeli basketball articles as a cursory Google search would yield and began what would ultimately become a 10-year research and writing process, culminating in Alley-Oop to Aliyah: African American Hoopsters in the Holy Land. Intrigued by what I’d read and eager to learn more, I reached out to basketball contacts I’d developed in the United States and Canada, and cold-called numerous others. In all, I conducted interviews with more than 40 people, some of whom I spoke to many times over the years. These players agreed to be interviewed by a stranger they knew nothing about, for a project whose outcome was uncertain. They were open and honest, letting me into their lives and entrusting me with their stories — it is a responsibility I have taken extremely seriously. Although I wrote this book, the stories on which it is based are very much theirs – their experiences, their perspectives, their unique and fascinating phenomenon. Alley-Oop to Aliyah has come a long way since that afternoon in Jerusalem, and I’m excited to see where it goes in the future. I will be posting pictures and videos that I’m confident you will enjoy. I’ll also be updating this blog frequently, giving you a sense of what went into the researching and writing of the book, updating you on appearances I’ll be making, and sharing some stories that didn’t make it into the final manuscript. Thank you for visiting the site, and I hope you find the content interesting!